As one of the worst flu seasons in years continues to sicken people across the U.S., one of its most striking aspects are the untimely deaths it’s caused: A 21-year-old bodybuilder; a 12-year-old boy; a 40-year-old marathoner. Infants, the elderly, and immunocompromised people are always at higher risk of dying from the flu, but how exactly does the flu kill an otherwise healthy person? 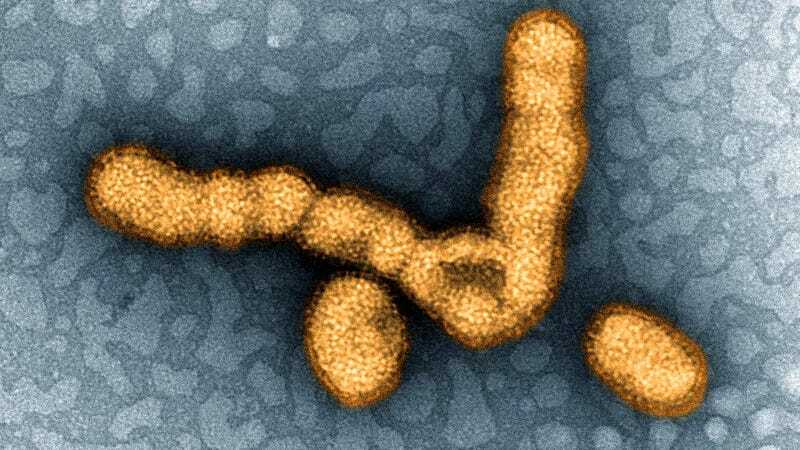 “The truth is, there’s still quite a bit of science that isn’t clear, but in general, when we talk about deaths related to influenza, there’s a couple of main mechanisms,” Dr. Daniel Eiras, an infectious disease and immunology expert at New York University, told me. When doctors like Eiras talk about “flu-related deaths,” they’re lumping in more than one kind of cause. Broadly, there are deaths caused by the flu itself, and deaths caused or aided by the bacteria that take advantage of the opening in the immune system’s defenses created by the flu. When the flu virus successfully sets up shop in our body, usually infecting our nose and throat cells, the body tries to fight back with a whole array of weapons, such as causing inflammation and launching T-cells and macrophages that turn the foreign invaders into goo. The flu’s symptoms—phlegmy cough, body aches, sore throat, and a fever—are the external result of this defense. It’s annoying for us, yes, but it generally works to eventually flush the virus out. However, when the flu turns deadly, it’s often because the virus, the bacteria that proliferated in its wake, or both have found their way to the air sacs of our lungs, causing an infection we call pneumonia. There, the microscopic battle can overwhelm our body. The lungs become inflamed, while our air sacs become flooded with fluid and pus. That makes it hard for us to get enough oxygen, and without and sometimes even despite supportive care, we essentially drown to death. Sepsis, which can appear alone or alongside pneumonia, can quickly lead to widespread tissue damage, organ failure, and ultimately death as the immune system attacks healthy tissue. It’s these flu deaths that we often hear characterized as coming out of nowhere, as in the case of 21-year-old Kyler Baughman, whose organs shut down in response to septic shock (a dangerously low drop in blood pressure) within days of first reporting symptoms. Even more rarely, the flu can also worm its way into other parts of the body, like the heart or nervous system, causing other serious, life-threatening complications. Children, Eiras said, might be at greater risk for sepsis because their immature immune systems are more likely to slip up and overreact to the flu. And younger people overall seem to be more likely to develop sepsis and pneumonia when the flu virus is particularly virulent and difficult to protect ourselves against—the sort of pandemic strains that engulfed the world in the early 20th century and more recently during the summer of 2009. What helps makes a flu strain pandemic is its novelty. The virus mutates into a shape that people have never or rarely seen before (and that our vaccines aren’t calibrated against), so it runs wild, easily spreading and sickening most any person it touches. This novelty also helps send the immune system into meltdown, leading to both more pneumonia and sepsis. But older people, though typically weaker against the flu, are more likely to have encountered some version of a pandemic strain in the past, granting them at least some level of immunity. This explains why flu pandemics tend to kill the young and healthy. The current flu season isn’t an example of this phenomenon, though. The main flu strain this winter, H3N2, is one we regularly face, though it is one of worst kinds of seasonal flu. Our vaccines are pretty bad at stopping it because of how fast it can mutate, which has led to overall less protection. But we have plenty of built-in immunity already. This flu season is expected to come close to or even surpass the death toll seen during the severe flu season of 2014-2015, in which 56,000 Americans died. But those deaths will still happen more among the elderly than any other group. These deaths, Eiras added, will come to the forefront of our (and the media’s) attention because they’re unusual more than anything else. But that doesn’t mean that young people shouldn’t worry about the flu, nor avoid things that can lower their risk of catching it or developing serious symptoms. “Getting vaccinated, not just for yourself but those around you, is really the best form of prevention and treatment we have. That and the typical things, like washing your hands and avoiding people who are sick,” Eiras said. Why Does the Power of the Flu Shot Change Each Year? How Scientifically Plausible Is the ‘Simian Flu’ in Planet of the Apes?